Bone Crusher disposers feature a 3 Bolt Mount System for fast replacement of existing 3 Bolt installations.Torque Master Grinding System2800 RPM LARGEST HORSEPOWER AVAILABLE!Balanced Turntable/ArmatureAnti-Jam Stainless Steel ImpellersStainless Steel Grinding ComponentsCorrosion Proof Grinding ChamberFull Sound InsulationRemovable Splash GuardPower Cord AttachedSilver GuardCorrosion ProofBone Crusher 1000 model carries a lifetime warranty against failure due to corrosion. 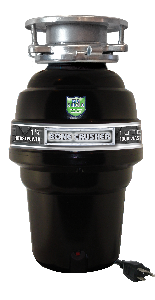 All Bone Crusher continuous feed models have a removable splash guard, ideal for easy cleaning and replacement. Anaheim Bio Shield disposers feature Speed Master Mounting, an exclusive system that provides fast and economical installation. Anaheim Bio Shield motors offer maximum torque instantly with the power to cut through potential jams. The compact design of your Anaheim Bio Shield food waste disposer allows inclusion where limited under counter space is available.